Is it right for Christians to celebrate Christmas like the rest of the world? Is it acceptable to blend Paganism with Christianity? Shouldn't we be no compromise Christians? Does God mind His people taking part in this yearly feast? Which by the way seems to start earlier every year, because as I write (update) this article, we are still in September and the shops have already started selling christmas items! More money is spent every year on gifts that are either broken within a couple of weeks, taken back to the shop, or they are stuffed into a cupboard somewhere never to be seen again. Now many people will just tell me to "lighten up", it's a time of giving and making people happy. Is that the kind of giving Jesus wants from us? Giving pointless gifts to people who already have too much anyway? If Jesus is the reason for the season, why do we need Santa? Do we reach Jesus through him? This is talking about an "all knowing god" who is going to judge the world and who will return one day to "reward" us for what we have done. This is taken from the Bible and attributed to Santa! Do you not realize that you are teaching your children to worship a false god? Now think about this for a moment. There are millions of people all around the world who are starving to death, and during this "giving" time of the year, BILLIONS, that's right, BILLIONS are spent on pointless "gifts" by us professing Christians, while these poor people continue to go hungry and die of starvation!! What an ABOMINATION that is to our holy God. I made a rough calculation on Christmas spending, and did you know that professing Christians themselves in just the UK and the USA spend about £45 Billion (75 Billion Dollars) on Christmas? And that is a conservative estimate! Now I would love to know where "doing justice and loving mercy" comes into that equation, because I can't see it! Now it's time for us Christians during Christmas to stop wasting so much money on junk and giving things to those who already have too much anyway, and start making a difference by giving to those who REALLY need it. Also, when was the last time after Christmas day that someone asked you "what did you give?" That's never happened to me! No the question is always "What did you GET?" There are THOUSANDS of people dying of starvation EVERYDAY! And yet all this money that BELONGS TO GOD is carelessly wasted on worldly stuff! What difference is there between a non Christian and a Christian during the christmas period? Nothing! You can't even say that Christians going to church is the difference, because even non believers go to church at christmas. Now what a light we true Christians could be to the rest of the world if we would say enough of this! Instead of wasting God's money on useless gifts, we are going to use that money to further God's kingdom on earth and help those in need. THEN we would be a witness for Jesus during this time of year. Billions could be raised and used for good, rather than wasted! And our GOD could be GLORIFIED!! The word "Christmas" (Christ-Mass) reveals exactly who blended Christianity with Paganism. The word Christmas is basically a combination of the words Christ and Mass. Now it was the Roman Catholic Church who brought about the tradition of Mass, (NOT to be confused with communion), and if you look at their history you will find that they absorbed many of the Pagan rituals and customs and mixed them with Christianity. If Jesus is the reason for the season, why do we need decorated trees? Does that make Jesus easier to see? As far as the 25th December is concerned, this date has nothing to do with the birth of Christ, because we know from the Bible that during the birth of Jesus, the shepherds were "watching their flocks at night", and for the sheep to be outside during the evening, the birth of Jesus could not have been during the winter on 25th December. It must have been during a warmer season, probably in the Spring. I also find it interesting that the date of Christ's birth has never been known and the Bible doesn't even hint at it, only that it was during a 'warm' season. The reason for that? I believe that God kept the day as a secret so that the DAY itself would not be idolized, the way we do with 25th December. So why do Christians celebrate Christmas on the 25th December? 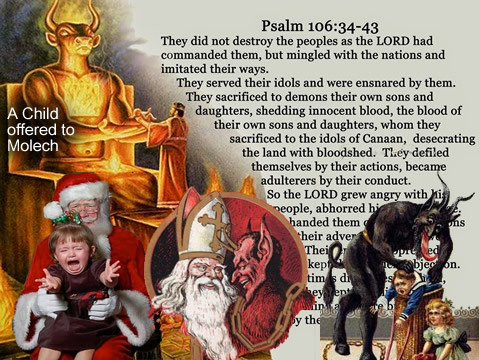 Well, it was the Roman Pagans that introduced that date to celebrate the rebirth of the sun god Saturnalia, and leading up to the 25th, they had a week long period of celebrations which involved much wickedness, ending with innocent people being brutally murdered. Do you see why the Roman Catholic Church used the name "Christ-Mass"? Mass is to do with death, and yet Christmas is supposed to celebrate the BIRTH of Christ. The Roman Catholic Church basically wanted to bring the Pagans onboard to boost it's numbers and allowed the celebrations of the Pagans worshipping the sun god to continue, but renamed the time as Christmas in honor of Christ's birth. But does this "Christian" celebration of Christmas give Christ honor? Absolutely not! Just look above at the amount of God's money that is wasted. If Jesus' birth is the reason for the season, why do we say "Merry Christ-mas" meaning Christ's death? Did you notice what they actually did? They blended Pagan worship with worship of the LORD. They built this golden calf, but proclaimed it as a FEAST TO THE LORD! This is exactly what Christians do every Christmas! And what did God think of it? ... Exodus 32:7,10 ...'And the LORD said unto Moses, Go, get thee down; for thy people, which thou broughtest out of the land of Egypt, have corrupted themselves. Now therefore let me alone, that my wrath may wax hot against them, and that I may consume them.' ... God was so angered that they had blended Pagan worship with worship of Him, that He wanted to destroy them. If Jesus is the reason for the season, why do we spend all HIS money on worthless gifts? Christians Celebrate Christmas Around a Tree? What about the presents? Yes, you guessed, another Pagan tradition. The Roman Emperors compelled the citizens to bring gifts and offerings during the Saturnalia in honor of the sun god. So what does the Roman Catholic Church do? They make up a story about this Saint Nicholas who supposed to have given gifts to people, hence why we have this "Santa Clause" character, of which the majority of professing Christian parents LIE to their children about. And who is it that the children honor and worship during Christmas? It isn't Jesus my friend, it's SANTA!! And just as an interesting thought, move the letter N in santa to the end, and you will see who is behind it! If Jesus is the reason for the season, why do our children give Santa all the glory? For a long time now, Christmas has been carelessly celebrated by professing Christians without even a thought about it's true origin, myself included up until recently. Many of the most popular Christmas customs - including Christmas trees, mistletoe, Christmas presents, and Santa Claus - are modern incarnations of the most depraved Pagan rituals ever practiced on earth. Should Christians celebrate Christmas? Not the way it is celebrated by the majority of professing Christians today. We say that it is a good time to witness for Christ Jesus, but we should be doing that EVERY DAY of the year. If most of us were honest with ourselves and God, we would have to admit that our thoughts are not on Christ during this time, but on the world and ourselves. So how should we Christians celebrate Christmas? By focusing entirely on Christ Jesus. By using HIS MONEY that He has entrusted us with to help the poor and needy and to further His kingdom on earth, rather than wasting it on pointless presents and indulgence. We should stand apart from the rest of the world and be a TRUE shining light for the Lord. This is how we should act EVERYDAY. It's time to stand apart from the rest of the world and be a true shining light for our Lord, Saviour and soon coming King, Jesus Christ. Does the Bible reveal the birth date of our Lord? Does the Bible give ANY special devotion to the day? No? Well, shouldn't we follow the WORD?